Sometimes the best part of ISTE isn’t what happens on the keynote stage or in official session rooms. This summer, with over 16,000 other attendees, I made the pilgrimage to the Georgia World Congress Center in Atlanta to take in the edtech event of the year: ISTE! By far, the best part of attending ISTE is the people. Meeting with other members of your Personal Learning Network (PLN) is awesome and adding new members to your PLN is the name of the game. Outside of networking, some of the other amazing parts of ISTE may not be as well known to the average ISTE attendee. Beyond the Hollywood keynote speaker, here are the best parts of ISTE that often fly under the radar. 1. Ignite Sessions: Presenters have five minutes and 20 images to tell a story about a person, idea, or product that has ignited their passion. The excitement is contagious, so it’s hard not to leave an Ignite Session feeling like you can change the world. 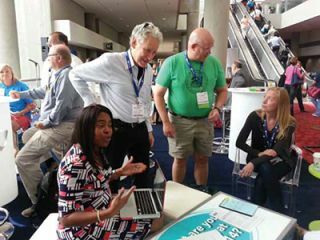 Hall Davidson, Director of Discovery Educator Network, participates in an impromptu discussion in the open spaces at ISTE. 2. Playgrounds: Playgrounds allow you to get hands-on experience and try out some of the great edtech ideas you have been hearing about. After learning about 3D printers, I was thrilled to finally get to play with one! It’s like having technology and ideas in action right at your finger tips. The Playgrounds are great. 3. Lounges: Whether you go to the Bloggers’ Cafe, the Social Butterfly Lounge, or the Newbie Lounge, the Lounges are a great place to recharge, meet up, and network with your fellow attendees. 4. Poster Sessions: Presenters are given two hours to demo a topic they’re passionate about. With so many booths and multiple presentations all happening at once, Poster Sessions have a very unconference feel to them. You can come and go as you please. Groups are often small or sometimes even one-on-one. These sessions are a great place to explore many different ideas at your own pace. 5. Hack Education: Hack Education is the free, all-day, unconference event held the day before ISTE begins. Several hundred participants got together for a great day of unconference learning. 6. ISTE: After Hours: There are a lot of places to explore after the official ISTE events close for the night. Many vendors sponsor social events with free food and drink for anyone who is interested in attending. Similarly, many PLNs pick a place close to ISTE to meet up and talk about their day’s experiences. Make sure and plan to attend as many after-hour ISTE events as possible. They are tons of fun and by far the best place to network. You can sleep when you get home! If you’re planning to attend ISTE 2015 in Philadelphia, make sure that you keep these events on your radar. They just might be the best part of your ISTE experience!